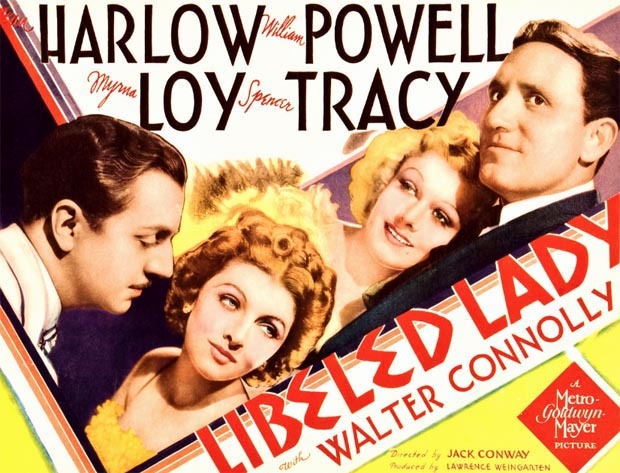 One of the best made screwball comedies of the 1930s, with glossy M-G-M packaging and four big stars all in their prime: Myrna Loy, Spencer Tracy, Jean Harlow and William Powell. The star billing is split four ways, and each actor is balanced against the other as far as importance to the plot and screentime, but it is Powell and Harlow's ridiculous back-biting at one another that steals the show. Like a championship tennis match, Harlow's comedic charm and William Powell's self-deprecating humor and sarcasm gets batted back and forth with each one scoring off the other. These two characters may not be meant for each other (the two get thrown together as part of a trick to end a libel suit by a defamed wealthy socialite played by Myrna Loy), but the pair play off one another in perfect synch which is silly and full of animosity while pretending to be in love (as part of the scam) but when no is watching, they loath, insult and throws things. Love will triumph in the end and each character will go home happy, but Jean Harlow is the one who ultimately steals most of the focus, and the one at the end for whom it is most important that she is happy.... and after Powell's character punches Spencer Tracy's character in the nose, she is.